The Hampton College team beaten at the last 32 stage. 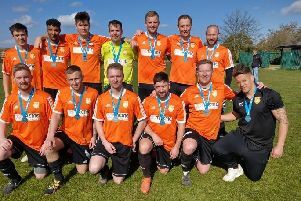 They are from the left, back, Ben Wright, Will Palmer, Jay Whyatt, Bradley Gilbert, Jazleigh Fife, Sean Spalding, Harry Smith, Elliott Lilley, front, Ross Knights, Dani Agboola, Sol McFarlane, Lucas Bickers, Jamie Cooke, Ben Johnston, Evan Walters. Hampton College’s great run in the English Schools FA Cup for Under 14 teams ended yesterday. The local lads were beaten 5-0 by a strong, physical Shenley Brook End School team from Milton Keynes, last year’s quarter-finalists, in the sixth round (last 32) of the competition at Yaxley FC. Action from the Hampton College v Shenley Brook End game. A total of 668 teams entered the competition.